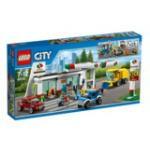 LEGO City Service Station 60132 Expert Reviews - Read Reviews and Buy Smarter Online. Verdict: He has expressed much joy playing with it. Verdict: This is a very good petrol station, useful in the city, on a highway, or an other location with a lot of traffic. I built the 1st version (without the carwash). I like the shop, the petrol station and especially the charging point (for bikes or cars).